Dreamforce 2018 is here! And there’s so much to do and see! To get the most out of the week I’ve put together some notes for #ServiceTrailblazers! Reserve your seat and put these sessions on your calendar! They span the world of customer service and are curated for anyone wanting to learn more about customer service and becoming a #ServiceTrailblazer! If you are Tweeting or want to follow what’s happening please join in the fun, share the info so everyone is included! The hashtags/handles are: #DF18 and #ServiceTrailblazers and @ServiceCloud @Dreamforce! 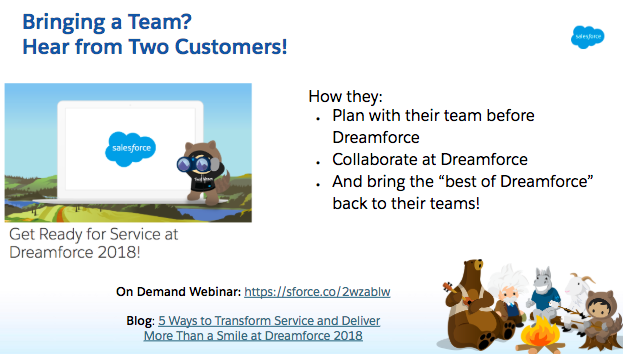 And bring the “best of Dreamforce” back to their teams! Let’s face it. The job of a customer service agent is not an easy job. In a typical contact center, agents are on the phone or communicating through other channels; email, text, web chat, Facebook Messenger, WeChat… When customers reach out to an agent, they need help and are often upset. They may be asking about a lost bag or debit card, a flight that was canceled or a delayed package. What’s important to remember is customer service agents dedicate their daily professional career to helping people solve these problems. As a company’s brand ambassadors, they are the guardians of a business’s customer relationships. A customer’s impression of a company is directly related to their experience with the contact center and its agents. And since customer experience directly affects revenue, it’s about time an agent’s job got a little easier and more enjoyable so they can better serve the customer. Unfortunately, in many contacts centers, customer service agents are asked to do more with less and do without the best technology. Imagine taking a calculator away from an accountant? They couldn’t do their job to the best of their ability. When we don’t provide agents with the best technology, they can’t possibly meet customer expectations. The result? Poor CSAT and agent attrition, which is very costly and part of what gives contact centers the black eye of being a cost center. It’s time things changed for both the agent and Customer Service departments. Enter Artificial Intelligence (AI.) There’s a lot of hype about how AI is going to shape the future. It’s often portrayed in Hollywood as robots taking over the world and at the very least, replacing jobs. The truth about AI and machine learning is that when it’s implemented responsibly it actually allows humans to focus on the type of work they actually enjoy. Take for instance the factory floor. During the Industrial Revolution, automated machines began doing the repetitive tasks human get bored with. There are still many people working in factories, but with automation, people can focus on performing critical jobs where their intelligence is required. In the Fourth Industrial Revolution, where technologies like AI are driving change, the trend for contact centers is similar. Rather than taking jobs away, AI is blending the best of human intelligence with AI, to provide improved, seamless experiences and at the same time improve agent’s job satisfaction. How does AI help customer service agents? First, AI bots take the burden off agents with intelligent, satisfying self-service by resolving routine customer requests. And when a customer wants to talk to an agent, the hand-off is easy. The interaction with the bot is transferred into the agent console so the customers don’t have to repeat what they did with the bot. This reduces agent’s average handle time because all the agent has all the customer interaction history. And first contact resolution is increased because the agent can quickly resolve the issue with the proper information and context. All of this adds up to increased agent job satisfaction and morale by off-loading routine, boring requests to the AI bot. Now let’s say a customer wants to talk directly to an agent without interacting with an AI bot. AI prioritizes and classifies cases to help your agents quickly understand what the customer needs to provide a more effective and efficient experience. AI collects information about the customer and the context of their request resulting in a more connected, personalized experience. And AI increases agent productivity with a world-class, omnichannel service experience with full context to customer’s request. As a result, agents have a sense of accomplishment by working on more challenging customer issues because the AI bots handle the routine questions. And when agents directly help customers, they are able to build loyal relationships because they are enabled by the best technology possible. And at the end of the day, the customer, their needs and exceeding their expectations is what great customer service is about. That’s all a customer service agent wants to do and it’s time contact centers gave the best possible technology to make this real. This report is about how Customer Service and Support is evolving into Customer Success Management as top differentiator by companies and brands that understand the importance of the digital disruption and how it is affecting their business and their customers. This is one of Constellation’s research team delivers its inaugural series on the state of the state. The state of the state research explores the impact of digital transformation, next-generation customer experience and matrix commerce from a systems perspective. It takes into account the political, economic, societal, technological, environmental, and legislative points of view. This research report explores a key area – customer service and support. The theme of Next-Generation Customer Experience analyzes how organizations are making the shift from systems of engagement to systems of experience and mass personalization at scale. Traditional viewpoints of the customer via marketing, sales, service and support, and commerce are collapsing. In fact, customers don’t care what department they talk to for marketing, sales, and service. Customers expect an organization to act as one entity and their front office experiences to match other experiences regardless of touch point. This customer-centric cohesion requires new paradigms in user experience fueled by the backbone of digital business, including social, mobile, cloud, Big Data, and unified communications. Technology provides a catalyst for new experiences as organizations move from selling products and delivering on brand promise via customer experiences which require a change in organizational DNA and leadership from both the top and from the empowered bottom. Get ready to make the shift as the front office becomes the back office, and marketing, sales, customer service, and loyalty form the basis of the new engagement strategy. Will you be ready for the next generation of customer experience?